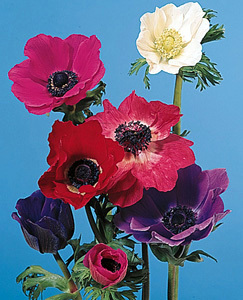 Home|Floral Library|Poppy Anemone – Anemone coronaria or A. spp. Decorative Life: 3-7 days, up to 10 days in flower food. While significant storage research is lacking, 32-28 degrees F is suggested. Probably what was referred to in the Bible as the “lilies of the field”. The specific epithet name of “coronaria” means of garlands in reference to a use for the flowers. The showy parts of the flowers are sepals, not petals. Placing this flower species in vases with daffodils is not recommended since the sap from daffodils can kill this species. Scientific name derives from the Persian word for Adonis. The flowers are said to have sprung from his blood when he died or from the tears of Aphrodite, who loved him. Do not use as focal points in arrangements because of their short vase life. Forms of the flowers are single, semi-double and double. Harvest when buds begin to open. Some fresh flower foods may damage stems but are still recommended. The practice of piercing a hole through the flower base to extend vaselife could not be substantiated in the research literature.